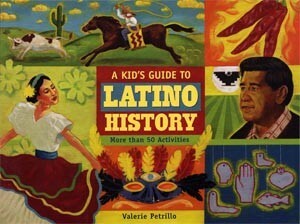 Featuring hands-on activities, games, and crafts that introduce children to the diversity of Latino culture, this guide teaches them about the people, experiences, and events that have shaped Hispanic American history. Broken down into sections covering descendants from Mexico, Cuba, Puerto Rico, the Dominican Republic, and Central and South America, topics include Spanish colonial history; the missions and early settlements in Florida, Arizona, New Mexico, California, and Texas; the Santa Fe Trail and the United States-Mexican War of 1848; immigration; and the plight of migrant farm workers. Sidebars focus on famous Latinos and language lessons, while projects highlight arts, games, food, clothing, unique celebrations, and folklore. Kids can fill Mexican cascarones for Easter, learn to dance the merengue from the Dominican Republic, write a short story using magical realism to learn about the literature of Colombia, make a Cuban sandwich, and create Guatemalan worry dolls. 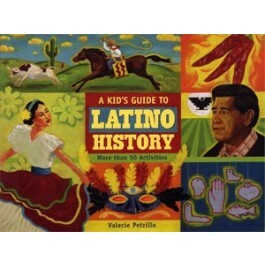 A time line, glossary, teacher's guide, and recommendations for Latino books, movies, museums, and websites round out this multicultural excursion.